Rediff.com » News » Can the Opposition take on BJP's incompetence? 'I confess that I do not see it,' says Aakar Patel. In the United States of America, President Trump is enjoying some popularity because of the second longest period of economic growth since World War 2 (which ended in 1945). In the last quarter the US economy grew at over 4%. We may not be impressed by this figure in India, but the fact is that the US economy is 10 times the size of India's though it has only one fourth our population. This means that the average American produces 40 times more than the average Indian. When the opposition Democratic party complains about Trump's personal misbehaviour or his lack of coherent and unified policies, he points to the performance of the economy and the number of people who have jobs. America goes into the mid term elections in three weeks and this will generally be the argument on which they are fought: The Democrats will say Trump is a dangerous lunatic and Trump will point to his performance. Of course, it is true that there are some serious issues with Trump's behaviour and even some people in his Republican party do not find him rational. But he has his base of support that is willing to overlook the opposition's arguments. Trump's ratings have improved because his narrative is winning. For a long time in 2017 and earlier this year, it was thought that the opposition would sweep the midterms because of its issues but now it is not clear that this will happen and it is possible that Trump's Republican party will do better than expected. It is the responsibility of the Opposition to put its vision forward if it wants to take control of the election. In India the narrative of an election is often controlled by the Opposition rather than the ruling party. Thirty years ago, the Opposition unified against the Congress (which had over 400 seats in the Lok Sabha) around the issue of the Bofors scandal. Rajiv Gandhi spoke about the India of the 21st century and tried to spin a positive message, but he failed. The fact is that negative issues in India tend to work better than positive ones. Any experienced politician will tell you this. The scandals and scams that were reported between 2011 and 2013 brought down the Manmohan Singh government. It was seen as incompetent, weak and unable to deliver and it was unable to defend itself against this charge. The fact is that similar accusations of incompetence can also be now made against the present government. Let us look at the list of things that have made the headlines because of negative reason. Demonetisation, lynchings, the fall of the Rupee against the dollar, the Rafale issue, the crisis in the farm sector, the failure of the promise to bring Rs 15 lakh to each Indian, inflation, the rise in the price of petrol and diesel, the accusation against ministers accused of sexual harassment and the lack of jobs in the formal sector. There may be other things as well. I have not included some things that are not usually election issues. The entire community of strategic affairs experts in Delhi are agreed that under this government we have surrendered space in our neighbourhood to China. Our position in Sri Lanka, Maldives, Bhutan, Nepal and even Pakistan has worsened dramatically in the last four years. As can be seen, there is no shortage of material for the Opposition to develop and deploy a campaign. Are we seeing signs that it exists? I confess that I do not see it. Certainly it does not appear to be either coherent or effective. And mind you, the government has not even begun its own campaign. We should expect that over the next few days (because of the crucial elections in Rajasthan, Madhya Pradesh and Chhattisgarh) the government will unleash a very powerful message that takes control of the narrative. It will probably begin with the unveiling of the Sardar Patel statue and continue from there. Almost all of this narrative will be based on claims rather than numbers. In the United States, jobs data is very good because there are many sources for it. In India because the formal sector of the economy is not big, the data is not good. We do not really know what is going on in most parts of the economy. Nobody is monitoring those parts because they are too small. The government will have to convince the population that they are doing significantly better today than they were in 2014. This is not easy to do. The data is on the side of the Opposition on most of the 10 issues that I have listed above. 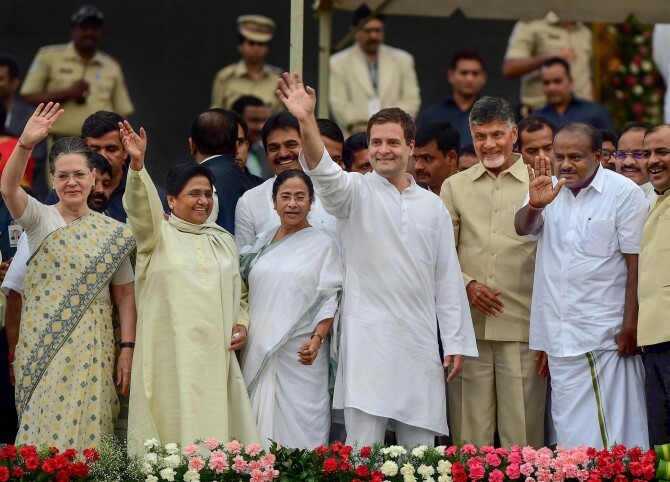 It is entirely up to them to set the terms of the election, and they will not get a more ideal set of conditions to do this than we can see around us in India today. Aakar Patel -- winner of the 2018 Prem Bhatia Award for Political Reporting -- is Executive Director, Amnesty International India. The views expressed here are his own.